Photo Booth Hire News Galway, Limerick, Mayo. Read all the stories of our successful Photo Booth and Selfie Mirror catered events, weddings debs and more! Hireaphotobooth.ie provide Selfie Mirror, Magic Selfie Mirror and Photobooth hire throughout Kilkenny City and County, we regularly supply for Weddings and Corporate events at Langton House Hotel , Kilkenny River Court Hotel, Mount Juliet Estate, Lyrath Estate, Newpark Hotel, Ordmonde Hotel , Hotel Kilkenny, and Springhill hotel. HIGHLY EXPERIENCED attendants who will interact with your guests not spend the night gawking at their phone . We bring a full range of BACK-UP EQUIPMENT to protect against any down time due to equipment failure or damage. We use TOP OF THE RANGE Selfie Mirror from the market leaders not the cheaper versions. Our Pricing is GENUINE AND UP FRONT , we don’t sucker you in with a cheap price and then charge you for every basic thing that should be part of the package anyhow . This full-length Magic Selfie Mirror Kilkenny captures full length photos using interactive touch screen technology. Once you’ve dressed up and had your photos taken you can then sign the Selfie Mirror and your signature will then print out on your photos . For our wedding customers we still include a guestbook where we put in a copy of the photos taken and then the guests can write a short message beside them, this way you get the best of both worlds. Instant prints for guests & WOW them with the writing on the screen feature. We do special daytime rates for Communions and Confirmations. Great discounts available for midweek events. Bored of the same old Photobooth ? Looking for Something New ? Well we have you covered with not one but two great Photobooth alternatives. Both are just as fun and provide lots of entertainment for your guests. The Selfie Mirror or sometimes called Magic Selfie Mirror is a sleek, more compact and interactive next generation Photobooth, the mirror has bright colourful animations that will wow your guests, and you can also write on the mirror with your finger , guests can write their name and then it will appear on the photo. Everyone that uses the Selfie Mirror will get a photo to keep and the best thing is that you also get a copy of all the photos in a nice quality guestbook. We bring a full range of BACK-UP EQUIPMENT to protect against any down time due to equipment failure or damage . 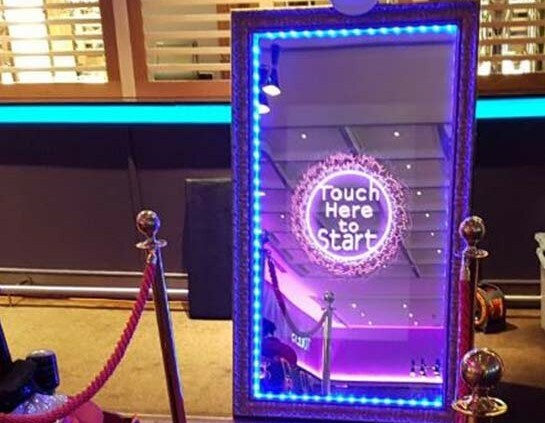 This full length Magic Selfie Mirror captures full length photos using interactive touch screen technology .Once you’ve dressed up and had your photos taken you can then sign the Selfie Mirror and your signature will then print out on your photos . For our wedding customers we still include a guestbook where we put in a copy of the photos taken and then the guests can write a short message beside them , this way you get the best of both worlds. We also provide Video Booths, guests enter the booth and we record a short video message from them, you get all of the video messages downloaded onto USB or disk. 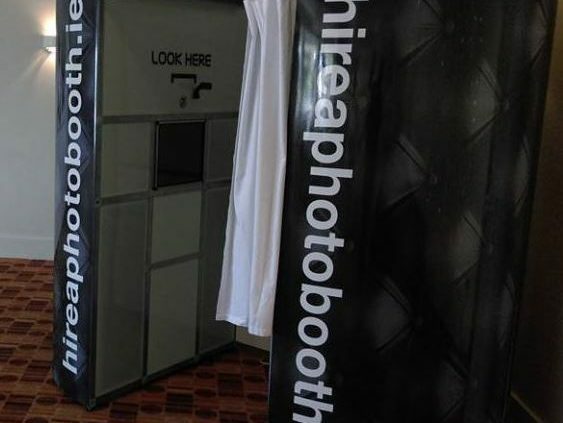 At hireaphotobooth.ie we are a Galway based supplier of Selfie Mirror and Photobooths of course for all of Galway City and Galway County. We have worked at literally hundreds of weddings in the last 4 years covering everypart of the county and further afield. Selfie Mirrors are great for capturing the more fun and off beat moments of a wedding, we dress your guests up in some of the props we supply so they look nice and fuuny before we take their picture, all guests that use our Wedding Selfie Mirror Galway get a photo to take home with them, all photos are printed straight away so no waiting around. We Supply a lovely guestbook to all our wedding couples, we fill it with a copy of every photo taken on the night and we also get guests to write a nice message beside their photo, so by the end of the night we have a book full of memories for you to look back on for years to come. For years we have been a go to place for Photobooth and Selfie Mirror hire for Galway couples, but don’t just take our word for it check out our reviews on facebook https://www.facebook.com/hireaphotobooth.ie/reviews/?ref=page_internal and our google reviews we were also a top rated supplier on weddingsonline while we were with them. Most of our custom comes from referrals so we treat everyone of your guests like they are a potential future customer. If you would like a quick quote for your Galway wedding or indeed further afield as we cover all of the Midlands and West contact info@hireaphotobooth.ie , our packages are very reasonable and we offer some really good package details. If you want to rent a Wedding Foto Boot then contact us info@hireaphotobooth.ie . Our Foto Boots (Photo Booths) are ideal for weddings and events, they capture the fun and excitement and provide lasting memories, with a Foto Booth Ireland from hireaphotobooth.ie we capture the more off beat moments from your big day than a photographer who just captures more formal images. We supply guests with funny props and encourage more “lively” photos. Why chose hireaphotobooth.ie for your event? We are established, experienced supplier unlike many pop-up operators. This is our fulltime job, we are totally dedicated to it. Instant prints for guests . If you want to rent a Wedding Selfie Mirror then contact us info@hireaphotobooth.ie . 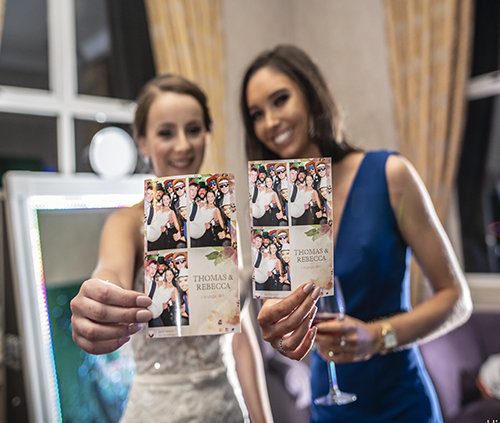 Our Selfie Mirrors are ideal for weddings, they capture the fun and excitement and provide lasting memories, with a Selfie Mirror Booth from hireaphotobooth.ie we capture the more off beat moments from your big day than a photographer who just captures more formal images. We supply guests with funny props and encourage more “lively” photos. We are an established supplier of Fotomaster Mirror me Photo booths. Mirror me Photo booths are ideal for parties, they capture the fun and excitement of all types of events and provide lasting memories, with a photobooth from hireaphotobooth.ie we capture the more off beat moments from parties than a photographer who just captures more formal images. We supply guests with funny props and encourage more “lively” photos. We are an established supplier of Photobooths and Magic Selfie Mirrors for Mayo and the West of Ireland. Selfie Mirror Booths are ideal for parties and weddings, they capture the fun and excitement of all types of events and provide lasting memories, with a Magic Selfie Mirror from hireaphotobooth.ie we capture the more off beat moments from parties than a photographer who just captures more formal images. We supply guests with funny props and encourage more “lively” photos. We are an established supplier of Photobooths and Magic Selfie Mirrors for Westport , Mayo and the West of Ireland. Photo booths are ideal for parties, they capture the fun and excitement of all types of events and provide lasting memories, with a photobooth from hireaphotobooth.ie we capture the more off beat moments from parties than a photographer who just captures more formal images. We supply guests with funny props and encourage more “lively” photos.